Just saw Flight. The preview had me hooked, but it was better than the movie. The first 20 minutes was edge-of-your-seat theater that you had to watch through your fingers, but it devolved into a character study and an ugly one at that. Without issuing any spoilers, Flight has a double-meaning. Denzel Washington's performance as the expert pilot and anti-hero was compelling and heart-breaking, but does it belong on the pantheon of his great performances? Just so happens that Backtime's Editorial Department has put together the definitive (and very unscientific) list. Washington's first feature film was a comedy in 1981. He appears as George Segal's illegitimate black son, and proceeds to unravel the corporate bigwig's entire world. This was irreverent 30 years ago, but it would be farcical today. Notice the DVD cover "introducing Denzel Washington." It is no small feat to play alongside a bona fide movie star in your first film. It springboarded Washington into a longstanding role on the TV series St. Elsewhere, before returning to the big screen in a big way. It's the black version of Godfather II. Frank Lucas goes from being Bumpy Johnson's driver to the biggest drug kingpin in New York. It's a great period piece which recalls an entire genre in our crime history and movies like The French Connection, Shaft, and Good Fellas. Washington's role as rogue cop Alonzo Harris was strong, but over-the-top. As a narcotics detective, he had to blend in, but the line got very blurred as to who the real villains were. His Academy Award for Best Actor was undeserved and more of a lifetime achievement award. Too bad it was 11 years ago and his career was far from over. On board a nuclear sub whose communications had been cut, Lt. Commander Hunter leads a mutiny against Captain Ramsey (Gene Hackman). It's a classic tug-of-war for power in a super-charged testosterone overload situation, with an excellent ensemble (Viggo Mortensen, James Gandolfini, George Dzundza). Washington is super cool in his toe-to-toe standoffs with Hackman. The grizzled, near-retired train conductor has to stop an out-of-control train, while training (see a pattern here?) the guy who will ultimately take his job (Chris Pine). It's a little bit of a guilty pleasure flick, but the theater I was in cheered at the end. 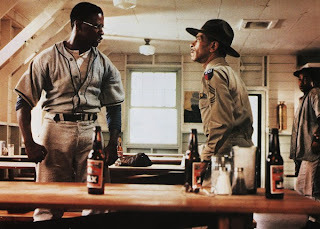 Washington's last film with Tony Scott directing. A brilliant sports film with great social depth. Washington didn't play it soft as T.C. Williams HS Head Coach Herman Boone. The lines from the film are no doubt recited thousands of times throughout football locker rooms around the country. Not only was Washington's resemblance to Malcolm Little uncanny, but he sold all the contours of his bio. He went from small-time hood and numbers runner, to a man of vision, to radical leader, to a man who got too close to exposing the hypocrisy that surrounded him. He was knucklehead, hater, and truth-teller all in one. 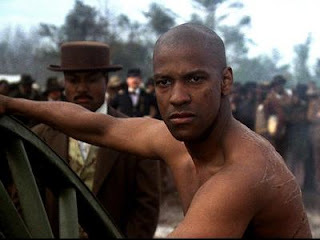 It was Denzel's first tour-de-force. The Civil War drama earned Washington a Best Supporting Actor Oscar. A runaway slave filled with hate was the foil for the all-black regiment that was fighting to help save the Union. He was punished for desertion when he went AWOL (though he was just out looking for shoes), and took his lashes while shedding a solitary tear in one of the most powerful scenes I can remember. A flawless performance as wrongly-imprisoned boxer Rubin "Hurricane" Carter, who goes through all the stages of grief, but never gave up in his greatest fight - for exoneration. The Bob Dylan song runs through my mind every time I think about it. Now I didn't see every Denzel Washington movie. Philadelphia and Cry Freedom are omissions that are inexcusable. Others I don't think I missed much like Man On Fire and Deja Vu. Re-makes like The Manchurian Candidate and The Taking of Pelham 1-2-3 would never be as good as the originals so they aren't even considered. A Soldier's Story was a great film, but essentially a play and really a true ensemble. And Washington was overshadowed by the evil Sergeant Waters (Adolph Caesar). Denzel Washington doesn't have scenes stolen anymore.